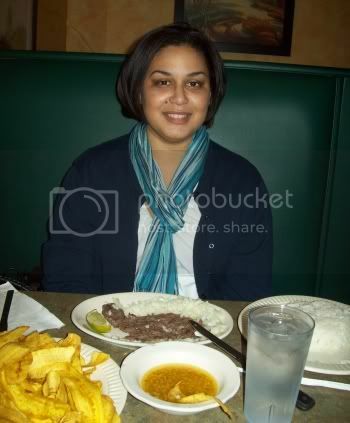 This is me at La Terasita in Tampa (a must eat) recently. They have spruced the place up a bit since last time I was in town, but the food is still cheap, yummy and plentiful. Here I am with fried plantains, black beans and rice and vaca frita (Friday Nights only) Delish! And here is something from last week sometime? Not sure when I took this, its been a bit of a blur. Its "budgeting time" at work and being one of the few analysts at our company, its CRUNCH time for me. I may be in and out over the next month or so for that exact reason. Am I wearing shoes? I hope I wore some to work this day. Hope everyone is doing GREAT, and thanks so much for reading! Bianca you are so cute! I love your skirt from Chadwicks. I need to do some shopping at Chadwicks. You find the cutest items. great wide leg trousers !!! I'm so glad I found this blog! I am very, very petite (4'11 1/4" hehe) and curvy. I do prefer "petite" (re: your sidebar) because it presents a message of pride & beauty. (Petite is soooo cute!) (BTW, I don't favor "_-challenged, but I sure am shopping-challenged. Shorter legs than petite pants and on a budget!) Also to fight back at those who think petite is skinny. That's 00 not petite jackets, pants, (arm/leg length) etc. I do like long waisted tops because of my belly though. A long time ago a blog commenter replied, "there is no plus petite" and I just got so sad. It sticks with me. I am a smaller size (~10) than I would be taller, so sure I'm not plus, but I think I look it or wicked close. I am too short to be a petite model (boo!) and plus sized models are like 12s anyway! Ugh. But if there are no plus petite SIZES that is another kind of sad. Looking forward to continue reading your blog!! I love the scarf in your first photo! Your two outfits are great, I love that pencil skirt in the first one and the red cardi in the second. Love that skirt and Love that scarf. You sure know how to pick great pieces!! I really like the last outfit and could totally copy it. Hope your work goes well and you'll be back soon. Gigi - I bet its beautiful! Corie - thank you!I do like the Chadwicks stuff I have. Curves Ahead - Thank you! Jen - thank you!Thanks for stopping by / commenting, and I love your blog! ManeCoarse - thank you! Much appreciated! Nurmisur - thanks girl. Its exhausting LOL. AHHH hearing La Teresita is a blast from my past. I used to eat here all the time when I lived in Tampa while attending USF. The mariquitas are delish. Yumm I got hungry just thinking about the good food.